Financial and economic reforms are interrelated. Of late, there has been an increase in bad debts and unrecoverable loans from corporate and individuals in India. Some of them run in crores and Indian government, banks and even private lenders were helpless in recovering the same from defaulters. The current legal procedures are too cumbersome and lengthy that they are practically ineffective in recovering the money. It was strongly felt that a new legal framework was urgently needed that is in conformity with international best practices in this field. At the same time the proposed legal framework was required to ensure ease of doing business in India. Keeping these objective in mind, the the Insolvency And Bankruptcy Code 2016 (pdf) was passed by Lok Sabha On 05-05-2016. The Bill was also passed by the Rajya Sabha (pdf) on 11-05-2016. It will become a law once President signs it. (a) Clear, coherent and speedy process for early identification of financial distress and resolution of companies and limited liability entities if the underlying business is found to be viable. (b) Two distinct processes for resolution of individuals, namely- “Fresh Start” and “Insolvency Resolution”. (c) Debt Recovery Tribunal and National Company Law Tribunal to act as Adjudicating Authority and deal with the cases related to insolvency, liquidation and bankruptcy process in respect of individuals and unlimited partnership firms and in respect of companies and limited liabilities entities respectively. (d) Establishment of an Insolvency and Bankruptcy Board of India to exercise regulatory oversight over insolvency professionals, insolvency professional agencies and information utilities. 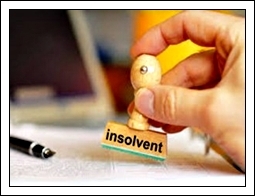 (e) Insolvency professionals would handle the commercial aspects of insolvency resolution process. Insolvency professional agencies will develop professional standards, code of ethics and be first level regulator for insolvency professionals members leading to development of a competitive industry for such professionals. (f) Information utilities would collect, collate, authenticate and disseminate financial information to be used in insolvency, liquidation and bankruptcy proceedings. (g) Enabling provisions to deal with cross border insolvency. The second pillar of institutional infrastructure is a new industry of `Information Utilities’. These would store facts about lenders and terms of lending in electronic databases. This would eliminate delays and disputes about facts when default does take place. The Insolvency and Bankruptcy Code is thus a comprehensive and systemic reform, which will give a quantum leap to the functioning of the credit market. It would take India from among relatively weak insolvency regimes to becoming one of the world’s best insolvency regimes. It lays the foundations for the development of the corporate bond market, which would finance the infrastructure projects of the future. The passing of this Code and implementation of the same will give a big boost to ease of doing business in India.